Opening a Joint Account - is it a good idea for couples? Should couples have joint bank accounts? It’s a debatable topic, but we’ve found opening a joint account to be one of the best decisions we’ve made! It took the hubby and I over 10 years to open a joint account. It was sort of a taboo subject for a while, with each of us wanting to retain our financial independence for as long as possible. Now that we have a joint bank account, we’ve found that the financial independence side of it doesn’t really come into it as we have the same goals and thinking around money matters. It’s the best thing we ever did for tackling our debt together and understanding our financial situation more accurately. But it’s not for everyone. Lots of couples steer clear of joint accounts, but why? Firstly, there’s the trust factor. What if your other half went on a spending spree or purchased something that was really expensive without letting you know? Or even upped and left and cleaned out the account? Yes, that’s a tricky one and I guess you have to really trust your other half before setting up joint banking. These points are something you need to discuss beforehand as to how you’d handle spending like this and what you would do with the joint bank account should you separate. Secondly, there’s the fact that some people may earn more than their partner and feel that by getting a joint account, they are giving up their hard earned cash and will no longer have the freedom to spend as they see fit. A way around this is for couples to keep their own bank accounts as a ‘spending allowance’ and also set up joint banking just for bills. Thirdly, some people just like privacy and financial issues are very personal, there’s no getting away from that. All of these things do need to be considered before opening a joint account together. You have to ask yourself whether you’re in a serious relationship and whether you can handle the emotional aspect of sharing your finances together. For our family, the emotional aspects took time to overcome. We dipped our toes in the water by opening a joint account for bills and still kept our own accounts too. We realised eventually that we were in it for the long haul so we needed to agree and have control on all of our finances. We then decided to merge our finances completely. My hubby and I never used to talk about what went on in our own bank accounts. We paid our main bills with no problems, so what else was there to discuss? We never discussed or questioned each others spending and because of this, we didn’t realise the extent of our debt as a family. When you have a joint bank account, it means you have to talk to each other about your finances and this in itself helps in terms of staying in control. If you’ve been reading my blog recently, you might have read my post – Is someone you know hiding debt? My world fell apart when I found out just how much debt my hubby (then boyfriend) was in. He didn’t tell me the extent of it at first because he was afraid I would leave him and he was trying to sort it out by himself. That way of thinking – sorting out our own financial messes – actually got us into more of a financial mess as a family as we were both doing our own thing and money matters got further and further out of control. Getting joint banking sort of forces you to be honest with each other about how much money you both earn, what your main outgoings are and how much you are both spending elsewhere. When you have a joint bank account, you can easily see (especially if you have online banking) how much money is coming in and how much is going out. This doesn’t have to be a case of checking up on each other – “I saw that you spent £40 of our hard earned cash on ITunes the other day!” But it can help you to identify unnecessary spending. When you know exactly what’s coming in and going out of your bank account, only then can you make a true budget and have a chance at sticking to it. If you have separate accounts, then it’s just too easy for both parties to spend money without really thinking about it. Once you have a budget in place, it’s possible to see the bigger picture and cut costs that you don’t really need. We were inspired to shop around for better deals and got rid of luxuries such as Sky TV and Love Film. We changed our utilities provider which saved us a fortune and by planning our food shopping around a menu, we managed to cut our grocery bill in half. If you have one joint account it’s much easier to track your spending on the whole. After a couple of years of being together my hubby and I got a joint account just for our bills and we had our own bank accounts too. This did nothing to help us track our spending as we were still reluctant to give up our financial independence to each other and we each had our own spending money. Once we decided to just go for it and merge our accounts completely, it became so much easier to see where we were going wrong with our finances. I look at this positively. You no longer need to go it alone, you can both be responsible for your financial future and that’s not a scary thing. With financial responsibility comes financial maturity and that’s got to be good. One of the first things I did when we set up joint banking (after drawing up a painful budget) was to rearrange the payment dates on all of our direct debits so that they are taken in the first few days of the month. That way, I know that all our major bills are paid early on and any leftover money can be repaid onto our debts. Generally speaking, everything is more straightforward from having one bank account number to remember through to having one total budget overall. If you have a good relationship with each other, then there’s no need to feel worried about possibly being checked up on financially. As long as you can be open and honest about your finances then there should be no problems. The hubby and I trust each other (now!) and if one of us needs to make a purchase that we don’t usually make, then we discuss it first before making that purchasing decision. Sharing and giving are both great things, so why not do it with finances? The whole concept of ‘my money is my money and your money is your money’ doesn’t really get you very far if you are committed to each other and want to live life together. We’re not precious about money anymore and I think that’s something that’s changed over time. If you’re in a serious relationship with someone and you both want the same financial goals, then perhaps opening a joint account is a way to achieve that. It’s certainly helped with our situation. By the way, if you do decide to combine finances, it’s best to start off on the right foot. Make sure you check out the best banking deals from a number of banks before you open an account, as some may offer a sign up bonus or cashback. (Here’s an overview of UK banks and contact details if you’re a UK reader). What are your thoughts on opening a joint account? Would you and your partner prefer to keep your finances separate or join them together? My wife and I joined account almost straight away. It was just easier for us and as you said – it kept us a lot more accountable knowing that someone else was watching the bank account. 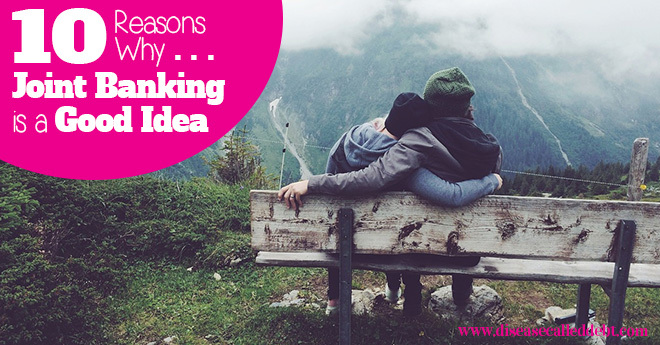 My hubby prefers not to get involved too much with our joint account – I tell him what’s going on and he has a look through it once a month or so! He’s happy to let me be the accountable one and I prefer it that way if I’m honest. But we chat about our financial affairs nearly every day. Good points shared. I do have a joint account with my hubby and this makes our monthly budgeting very easy as we are more accountable for our expenditures. Thanks Rita. 🙂 I’m glad to read that joint banking is successful for you and your husband! For us, it’s changed the way we view our finances completely. That’s a comprehensive list of reasons. My favorite is tracking spending: it’s so much easier to keep tabs when everything is on one place. My wife and I shared our finances preposterously early in our dating relationship (like, less than 6 months in). But we’re weird. I think a lot of the issues you’ve mentioned take time to address and sharing everything isn’t for everyone. Right now my husband and I do both. We have our own separate accounts and a joint account to pay for our joint expenses. We still have separate investments though but that might change in the future. Thanks so much for stopping by! Having a joint account and separate accounts is a good starting point for sharing financial responsibilities. I think that the way Mo Houses is doing it is probably the safest. I don’t think joint accounts are necessary at all unless you want to have one. I’d argue that I have trust in my fiance because we don’t do joint. I just don’t stress about what he’s spending money on because we’re on the same page. But here’s the real reason I’m against 100% joint: I’ve been through a divorce. I was one of those people who thought it would never happen to me. (Even though one of every two marriages falls apart here in the States.) It did happen, though, and he got to the ATM before I even knew he was robbing my savings. (I guess technically, because it was a joint account, it was ours.) And he had every legal right to. I’m so sorry to hear about your divorce and what happened with your joint account, that’s really harsh. I can understand why you’re reluctant to share your finances again! And I do get your point about it could happen to anyone. Maybe when we have some money for disposable income we’ll get our own savings accounts just in case. But at the moment, we don’t have two pennies to rub together so if we split, there wouldn’t be much to take! That’s great! 🙂 I’m glad to read that you’ve found sharing your finances a positive experience! My wife and I have joint banking and have done from the start. I agree with the statement you made though that you have to have common goals – if you are not aligned then this can cause serious serious pressure! Thanks for stopping by! Yes, having the same ideas around finances is imperative isn’t it to move forwards not only with your finances but also in your relationship! Not at all selfish! 🙂 It’s really not for everyone and if you’re used to being independent then I can see why you’d prefer to do that. I think having both a joint account and separate account is a good way around it. Lol! My hubby used to be the spendy one but not these days. The debt situation has scared him off money for life! We don’t have joint accounts because we’re not married. But I suspect once we do get married I think we’ll probably merge our accounts. I think being on the same financial page is incredibly important and if you don’t share your accounts you might not know the other person’s spending and saving habits. KK @ Student Debt Survivor recently posted…Professors Deserve Respect! Interesting post! My wife and I opened a joint checking account, but we didn’t really use it. But we finally really combined finances a few years into the marriage and I agree that it is better. While we both aren’t big spenders so I wasn’t worried about that, but I do think joining finances do open the lines of communication and it just makes things simpler. Andrew@LivingRichCheaply recently posted…Keep Your Income High This Summer! I’m glad that combining your finances works well for you and your wife. 🙂 Communicating about finances was really hard for my hubby and I when we first met and I think this was half the problem which led us into debt in the first place. Joining our finances has really helped us! I think if you can be upfront about finances then that’s half the battle. We were never upfront about money at the start as we were both too embarrassed about our debt! 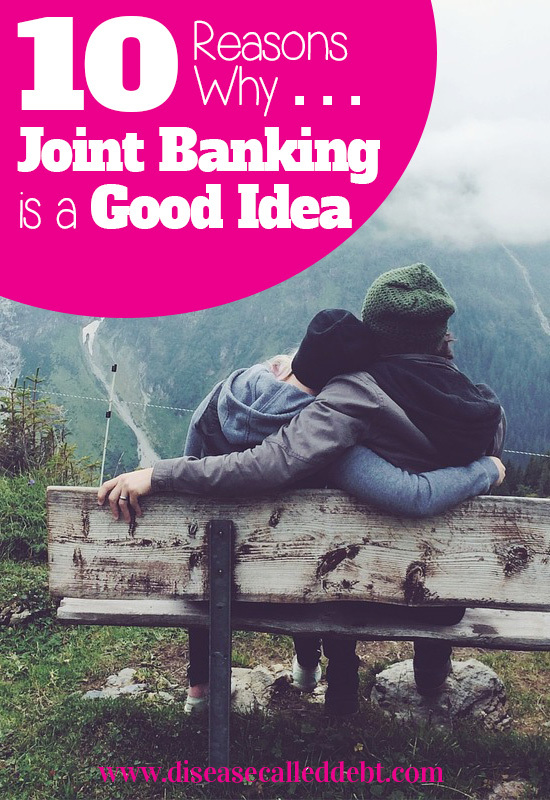 I also think joint banking is a good idea – especially if you both know that you’re in it for the long haul. Like you say, it’s harder to work towards joint goals and tackle money problems together without at least a joint account for the basic expenses. My husband and I have a joint account for basic bills but still maintain separate accounts that we get our paychecks still transferred into. We communicate daily about money and about what we’re doing with our money – so far, it works well. Communication is the key to openness and honesty around money matters! We did both a joint account for basic bills and kept our own accounts for a while but because we didn’t keep tabs on our personal consumer debt (as these payments were made out of our separate accounts), we ended up in trouble. That’s probably due to the fact that we avoided talking about debt for such a long time!